THE MOST POWERFUL DURAMAX DIESEL EVER NOW RUNS CLEANER TOO! The enhanced, legendary Duramax 6.6L Turbo Diesel is the most powerful Duramax ever built – generating more horsepower and torque than ever before. This proven powerplant gets the job done while being friendlier to the environment. The improved Duramax uses the latest emission control technology, reducing Nitrogen Oxide (NOx) emissions by a whopping 63% when compared to the 2010 model. 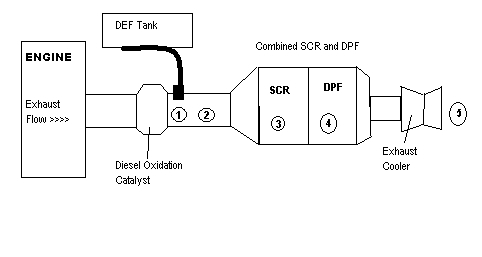 GM engineers determined the best way to accomplish this remarkable reduction of diesel emissions was to employ a Selective Catalytic Reduction (SCR) system that uses Diesel Exhaust Fluid (DEF). The Diesel Particulate Filter (DPF) then captures soot to incinerate it during regeneration cycles. Water vapor, nitrogen and reduced emissions exit the exhaust system. Diesel Exhaust Fluid is a non-flammable fluid comprised of 33% ammonia-based urea and 67% purified water. DEF is used with diesel engine exhaust systems to reduce the amount of emissions produced by turning Nitrogen Oxide (NOx) into nitrogen and water vapor. DEF technology has a proven track record since it has been used in Europe for years. DEF shelf life is typically at least one year, depending on the storage temperature. It is best stored out of direct sunlight at room temperature. Small DEF spills can be cleaned up by absorbing it with dry earth, sand, or other non-combustible material and scooping it into a container for disposal. While DEF is not listed as a hazardous waste by the federal government, please use proper disposabl methods. Do not empty into drains; dispose of this material and its container in accordance with all applicable local and national regulations. There is no guessing involved when it comes to maintaining a correct DEF level with this system. An electronica onboard warning system provides you with numerous warnings in the Driver Information Center to help you maintain adequate DEF levels, alert you if the DEF quality is poor or if there are concerns with the system. See your Duramax owner’s manual supplement for a complete description of the electronic onboard warning system and its warning messages. The electronic onboard warning system will provide a message alerting the driver when the DEF level is around 1,500 km remaining range. Additional messages that must be acknowledged alert the driver at the 500 km, LOW, and 0 km fluid ranges as the DEF tank gadually empties. The fluid level in the DEF tank must be maintained for the vehicle to run correctly. If the DEF tank is allowed to run empty, the system will alert the driver. If fluid is not added at the next vehicle start, the vehicle speed will be limited to approx. 88 km/hr and ultimately to 7 km/hr in accordance with federal requirements. Always add at least 4 L to release the vehicle from any speed limitation. Once the system is refilled, the system resets itself and a service visit is not required. It may take up to 30 secondsin park or several km of driving to update the DEF level warning. DEF freezes at approximately -11 degrees celsius, so the tank and DEF system are designed to freeze in cold climates. If DEF is frozen, the vehicle will still start as it always has. There is a second tank inside the DEF tank that is heated in 270-minute intervals while the engine is running, to ensure DEF fluid is thawed. This cycle was originally 90 minutes and that produced some of the freezing problems with trucks located in cold climates for extended periods of time, but the new program extends the cycle to 270-minutes to ensure enough DEF is circulated to keep the truck running at optimal standards. Residual heat from this internal tank helps to heat and thaw the remaining DEF in the larger tank. Do not overfill your DEF tank, as freezing will cause the fluid to expand and in turn could damage the tank. 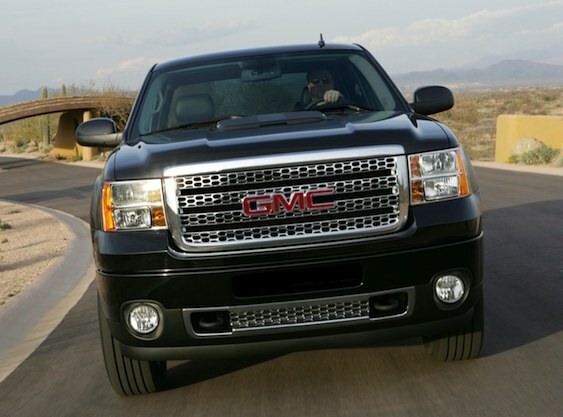 GM issued a press release not too long ago regarding the new emission control technology for their 2011 Duramax Diesel. We had a post about the new Duramax last month, so this information should clear up some of the questions we all had about the size of tank and heating system on the Urea injection. GM’s 6.6L Duramax diesel features the latest in emission control technology, making it the cleanest Duramax engine ever produced, with NOx emissions reduced by at least 63 percent, compared to the 2010 model. NOx emissions are controlled via a Selective Catalyst Reduction aftertreatment system that uses urea-based Diesel (Emission) Exhaust Fluid (DEF). The DEF is housed in a 5.3-gallon (20 L) tank and needs to be replenished about every 5,000 miles (8,000 km). Electrically heated lines feed the DEF to the emission system to ensure adequate delivery in cold weather. 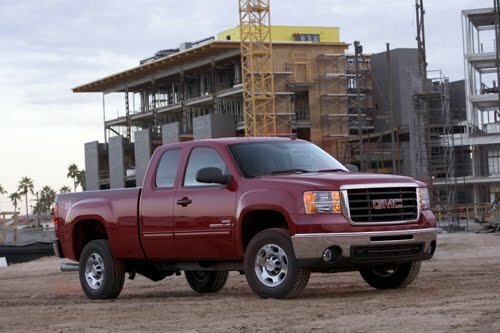 The 2011 Duramax 6.6L will also include GM’s second-generation diesel particulate filter system. Unlike most of the competition, the Duramax regenerates its diesel particulate filter using a downstream injection of diesel fuel directly into the exhaust stream and can travel up to 700 miles (1,125 km) between regenerations – a 300-mile (482 km) increase over the previous Duramax engine. The use of downstream injection also helps to improve engine life by eliminating concerns surrounding the possibility of diesel fuel contaminating engine oil, which can happen when fuel used for regeneration is introduced directly into the cylinder. We should be receiving the new Duramax trucks in the 3rd quarter of this year – check back for any new information. Why the need for a new round of updates to the Duramax just three years after the current engines arrived? On Jan. 1, 2010, all new diesel-powered vehicles had to meet tougher federal diesel emission standards that will reduce allowable nitrogen oxide levels by 90 percent from today, 96 percent from 1994 levels. NOx is a major air pollutant that contributes to smog, asthma, and respiratory and heart diseases. It’s a byproduct of diesel’s high combustion temperatures. The new Duramax diesel engines are built to meet new clean-air regulations, plus they feature other key improvements in technology and capability. Like today’s Duramax, the Isuzu-GM joint venture engine will continue to be available in two versions. The LML will be paired with an Allison six-speed transmission while the LGH will be mated to GM’s in-house 6L90 six-speed gearbox, which is also matched with the 6.0-liter V-8 gas engine. The two biggest technical changes Arvan shared details about are the Duramax’s all-new selective catalytic reduction and its enhanced exhaust gas recirculation systems — which are needed to scrub NOx down to no more than .2 grams per horsepower/hour — as well as its approved use of B20 biodiesel. That’s 80 percent ultra-low-sulfur diesel and 20 percent biodiesel. NOx selective catalytic reduction uses diesel exhaust fluid. The urea-based solution (32.5 percent industrial urea and 67.5 percent deionized water) is held in a 5.5-gallon storage tank and injected as a fine mist into the Duramax’s hot exhaust gases. The heat turns the urea into ammonia that — when combined with a special catalytic converter — breaks the NOx down into harmless nitrogen gas and water vapor. The exhaust fluid refill point for the HD pickups is mounted under the hood of the engine, while the vans’ is positioned next to the fuel door on the side of the vehicle. The tank is mounted on the side of the driver-side frame rail. Arvan says diesel exhaust fluid refill intervals will vary depending on duty cycle. Some customers will only have to refill during routine maintenance, such as when the oil is changed, while others will have to top off the tank sooner. “If they’re towing frequently, they’ll [likely] have to fill up with DEF again sooner,” Arvan said. To ensure that the exhaust fluid tank is refilled, Duramax-equipped trucks will warn the driver when the fluid is down to a 1,000-mile range. A series of start-up warnings — including lights, chimes and messages — will become more frequent until the tank is empty. If the driver continues to operate the truck with a dry tank, after a final warning and restart the truck will only operate in a “limp-home” mode that limits speed to just 5 mph until the tank is refilled. The selective catalytic reduction and diesel-particulate filter systems depend on a diesel oxidation catalyst that’s positioned downstream, behind the engine, to start the NOx and soot-scrubbing processes. The catalyst requires high temperatures to perform. Those temperatures are achieved on-demand by the addition of a new fuel injector that’s been positioned directly behind the exhaust outlet of the Duramax’s variable-geometry turbo instead of using the engine’s eight existing in-cylinder injectors. Fuel is squirted into the hot exhaust and burns, quickly raising temperatures in the catalysts. The LML and LGH also make greater use of exhaust gas recirculation across the Duramax’s power band than did the LMM Duramax. The system recirculates a portion of the engine’s exhaust back into the engine at a lower temperature. The cooled gases have a higher heat capacity and contain less oxygen than air, lowering combustion temperatures and reducing the formation of NOx. Exhuast gas recirculation is prevalent in today’s clean-diesel engines to reduce NOx, but it’s not efficient enough in its current form to meet 2010 emissions levels in GM’s trucks, hence the use of selective catalytic reduction also. Power ratings play a role in how much emissions equipment is needed. We think there will be a significant power bump when the final numbers are revealed. The LGH Duramax has a smaller exhaust gas recirculation cooler than the LML motor because of its lower power ratings. It also has a smaller radiator and cooling system. Efficiency improvements to the recirculation system include new separate cold and hot circuits that allow exhaust gas to recirculate immediately after engine startup, when engine temperatures are still relatively cool and when the engine is idling. In addition to burning cleaner, the LML/LGH Duramax can also burn greener. It’s certified to burn B20 biodiesel, up from the LMM’s B5 rating. Another big change to the Duramax’s fuel system is the first-time use in the Duramax of piezo electric injectors, which can react faster to fuel demands than the old solenoid injectors could. Fuel pressures are up from 1,800 bar (26,000 psi) to 2,000 bar (29,000 psi) for improved fuel atomization and combustion control. The piezo injectors run on an all-electric circuit in the engine, which helps explains the high-voltage cable we’ve seen in spy photos of the engine. The new Duramax keeps the same Garrett-supplied single turbo setup of the LMM Duramax, though the compressor and turbine wheel diameters and blade trims have changed. The turbo also uses the same “boreless” compressor wheel. The Duramax also continues to use a conventional gray iron engine block, but it’s been structurally enhanced around the lower skirt to help reduce noise, vibration and harshness. Combined with a new pre-combustion fuel-injection scheme that injects two pilot injections into the cylinder before the main injection, noise levels have been reduced up to 50 percent in the 1,500-1,600 rpm peak torque operating range. “We focused on getting NVH down in the heaviest driving points,” Arvan said. 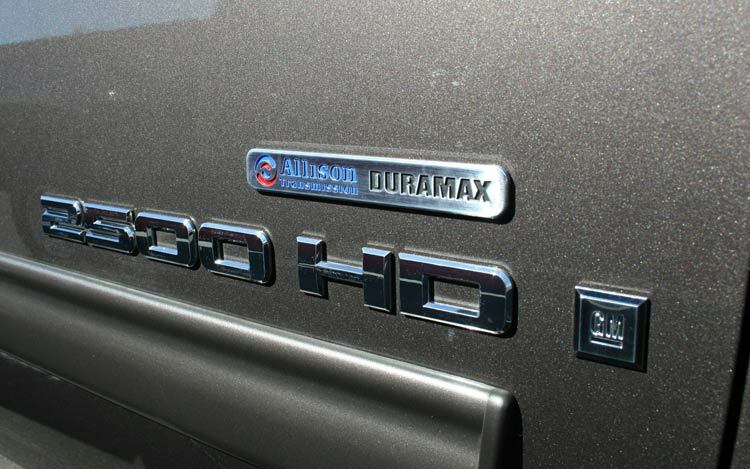 We briefly drove a 15-passenger Chevrolet Express 2500 van with the LGH Duramax diesel under its hood. While we weren’t able to do much more than a few quick starts and stops and some city-driving route simulations, we could immediately tell the engine was much quieter than the current LMM Duramax. Arvan said the van we drove was pre-production and only about three-quarters of the way through finalizing its engine calibrations. Another change is reduced engine-idle speed. Arvan says it’s been reduced from 720 rpm to 640 rpm in the pickups. The van is able to idle at only 600 rpm. All new engine controllers are needed to manage the sophisticated fuel and emissions system. Arvan says they have twice the number of calibrations as the previous LMM diesel to help the engine run as efficiently as possible across the widest range of operating conditions. The oil pump is slightly bigger, plus there have been some minor changes to the crankshaft and pistons. Aluminum heads — a Duramax hallmark — remain. Engine weight is said to be comparable to the LMM engine. Arvan also says fuel economy will remain the same — a key concern of any new diesel owner given the emphasis on clean emissions over operating efficiency. What isn’t GM yet sharing about the 2011 Duramax? We still don’t know final power ratings for the HD pickups, and there are still a few surprises for a later date — like perhaps an integrated exhaust brake. We’re definitely looking forward to getting the new Duramax trucks and getting to see this new technology for ourselves. Thanks to pickuptrucks.com for the info.